His playing technique is characterized by analytical depth and balance of sensitivity and superior technology” or “Wallisch does not interpret, he is making music in a sensitive manner” could be recently read in the international press about the renown pianist Gottlieb Wallisch who will perform his piano recital as part of the Beethoven festival in the magnificent hall of the Augustinian monastery of Klosterneuburg on June 18th. He is going to play the sonatas by Joseph Haydn and preludes by George Gershwin, finally paying homage to Ludwig van Beethoven with the interpretation of his “Waldstein Sonata” – composed during his residence in the Eroica House in Wienerwald. 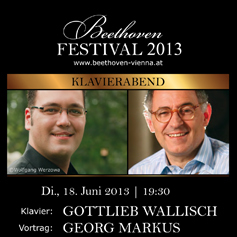 The lecture by the best-selling author and “Kurir” columnist Georg Markus on “New Knowledge about Beethoven’s deafness” will be held before the concert. It is probably one of the world history biggest tragedies that Ludwig van Beethoven, one of the greatest musical geniuses of all times lost his hearing at the age of 26. Georg Markus talks about the course of the disease and tells about the research by two Viennese physicians have revealed the secret of Beethoven’s deafness a few years ago. The tickets are available in Klosterneuburg Stift / at the Sala Terrena visitor reception.